The withdrawal follows years of unresolved dispute over Russian compliance with the 1987 pact. The Kilauea volcano's eruption has destroyed 40 buildings and forced more than 2,000 people to flee their homes. A bungling thief in California struggled to steal a gumball machine from an animal shelter. Hundreds of thousands of faulty red Skittles were found on a rural US highway after falling off the back of a truck. The incoming White House press secretary has said Donald Trump's speech is going to be "less of an agenda." 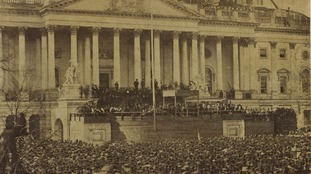 The picture shows the first ever US presidential inauguration to be captured by photographers. Republican Donald Trump will be sworn in to the office of president on January 20. Zion Harvey received a double-hand transplant last July after having his hands and feet amputated as a toddler.